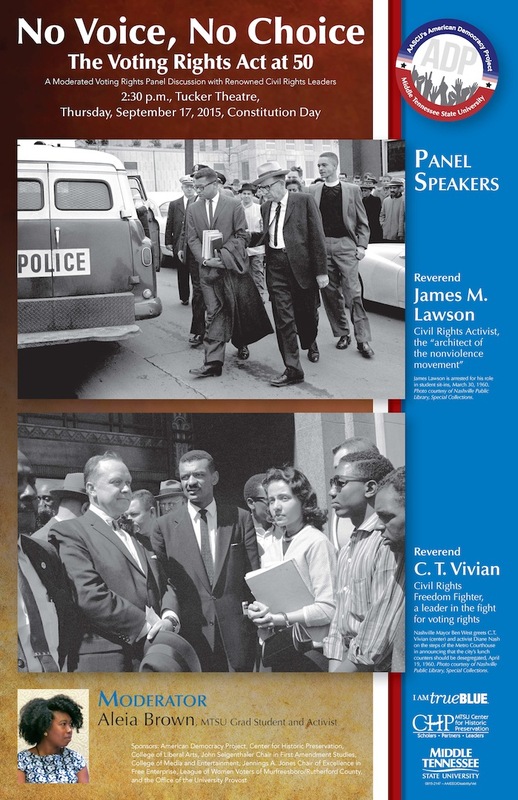 In honor of Constitution Day, the John Seigenthaler Chair of Excellence in First Amendment Studies is co-sponsoring “No Voice, No Choice: The Voting Rights Act at 50,” featuring legendary activists the Rev. James Lawson and the Rev. C.T. Vivian. The program is set for Thursday, Sept. 17, at 2:30 p.m. in Tucker Theater. Admission is free and open to the public. Lawson and Vivian, trusted advisers of the late Rev. Martin Luther King, were literally on the front lines of the Civil Rights movement and were instrumental in moving forward importation legislation, including The Voting Rights Act. The Voting Rights Act, signed into law five decades ago by President Lyndon B. Johnson, ensures that state and local governments pass no laws denying American citizens the right to vote based on race. Since then, the U.S. Supreme Court has declared part of the Voting Rights Act unconstitutional, but congressional leaders have recently introduced a bill to restore the law. Aleia Brown, an MTSU doctoral student in public history and former curator at the National Afro-American Museum in Wilberforce, Ohio, will moderate the panel. Constitution Day is an annual campus event that features the articles of the Constitution read aloud by students, faculty and staff and voter registration by the League of Women Voters. For a list of MTSU campus readings, click Constitution Day. Sponsors for “No Voice, No Choice” include MTSU’s American Democracy Project, Center for Historic Preservation, College of Liberal Arts, John Seigenthaler Chair of Excellence in First Amendment Studies, College of Media and Entertainment, Jennings A. Jones Chair of Excellence in Free Enterprise, Office of the University Provost and the League of Women Voters of Murfreesboro/Rutherford County. See video excerpts of Lawson and Vivian, respectfully, discussing the nonviolent strategy for a PBS special on the Freedom Rides here. Fore more information about MTSU’s Constitution Day events, email American Democracy Project MTSU at amerdem@mtsu.edu or go to www.mtsu.edu/amerdem.